Come and enjoy our absolute waterfront Riverside Townhouse. It is 1 of only 4 in the complex and enjoys magnificent views across the water where the night lights and sunsets are stunning. You can enjoy a leisurely walk into town via the beach, conditions permitting. Enjoy the grassy beach reserve with plenty of space for a game of cricket or fly a kite and the calm bay waters are perfect for small children and for fishing, sailing, kayaking etc. Our property is suitable for families of up to 5 people or couples wanting that all important beach side escape. There is a queen bed in one room and a double with single mattress in the other. The double garage will only fit one car but is a good secure area for your dog if you should go out and want to leave him at home. Electric blankets are provided in the cooler months and built in robes have plenty of storage and hanging space for all the family. We can also provide a free cot and high chair and baby bath on request. Downstairs - cathedral ceilings accentuate the open plan kitchen, dining and living area designed to capture that all important beach front outlook and provide you with a relaxing and comfortable stay. The kitchen, lounge and dining are on the ground floor along with the laundry and secoind WC for your convenience. The property also offers all life's essentials in the kitchen, including an espresso machine and the fully equipped laundry together with entertainment in the living area from books, puzzles and childrens' toys to a large digital TV, DVD/CD player including some CD's and and quality stereo system with radio, cd player and iPod dock/aux cable. Ceiling fans are in all rooms together with gas heating and electric blankets in the winter are also provided for your comfort. A picnic basket with thermos and esky is provided if you wish to venture further and enjoy some of our nature reserves or just picnic on the beach. In the garage we have provided beach toys, a portable BBQ and outdoor table and chairs which can be utilised for those summer evening BBQ's beach side. There is also excellent mobile phone reception for those of you who can't quite escape from it all. There is a local superette with a very competitive bottle shop and take away and hair salon a few minutes walk away or if you want to walk into town, this is only 15 minutes away. Local attractions include Mogo village and zoo, Birdland, bushwalking, fishing, golf, river cruises, fishing charters and hire boats. We have 2 cinemas, several clubs and an expanding shopping centre with wonderful al fresco restaurants where dogs are allowed if eating outside. Our competitive tariff does not provide for linen (sheets and towels) which can be supplied on request for $10 per person of $15 per person if you wish the beds to be made up for you. Flexible arrival and departure times can be enjoyed, vacancy permitting. We have a 2 night minimum stay on weekends and during school holidays and 3 nights on long weekends, 7 nights over the summer holiday period.. Single nights will be considered and may depend on the day of the week and other bookings but a $40 surcharge applies. We require a $500 security deposit on all bookings. ALSO PLEASE LET US KNOW IF YOU WISH TO BRING ANY PETS WITH YOU. We are dog lovers and welcome yours also. The property is unfenced but dogs are allowed inside provided they are house trained, kept off the furniture and kept well groomed to minimise hair and sand in the townhouse. Please vacuum if your dog has been shedding. The double garage also provides a shady and secure area for your outside dog. You will need to bring all your pets requirements (bedding and food bowls). We also recommend treatment for ticks as the eastern coastline is known for them. The beach is also dog friendly and leash free. A small pet fee of $20 is applicable - please advise at time of booking if you wish to bring your pet. This goes towards more frequent carpet cleaning. preventative flea treatments etc. We book weekly over the summer holiday period, have a 3 night minimum on long weekends and a 2 night minimum on weekends. We do not charge a cleaning fee but please leave the property as you found it and especially leave the BBQ and all cookware clean or a penalty may apply. Sand is a constant issue and is very damaging so please remove before going inside. We are located within the bay but it is only a short drive to the surf beaches. 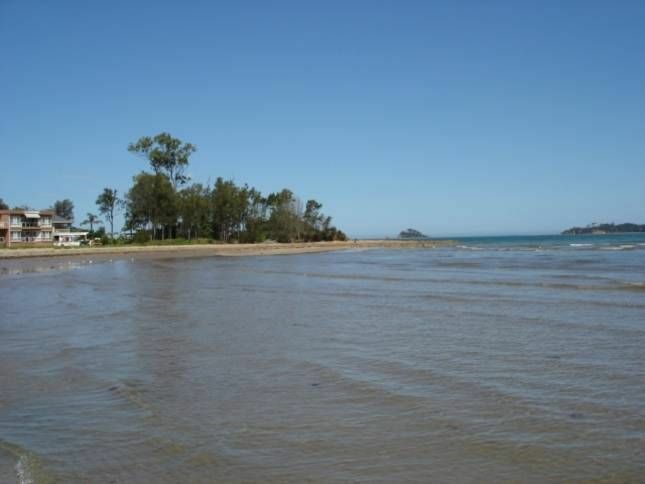 Malua Bay beach is patrolled on weekends between October and the end of April, but full time over the summer holidays. Full length windows facing west, looking across the Clyde River towards town and Batehaven. Lovely sunsets and lights over the water at night. Uninterrupted views of the river. Only 10 metres across a grassy reserve onto the sand. No roads to cross and very safe for children. The beach is also pet friendly. Just some of the basics. Selection of childrens and adult movies. You have all the beach and beach reserve to enjoy which is outside your back door. Being only 2 kilometres to town, we are very close to the many restaurants and cafes, only 10 minutes to Mogo with it's craft and antique shops and the Mogo Zoo, passing the Botanical gardens on the way. We are however in a quiet residential area away from the tourist crowds on a calm safe beach - ideal for kayaking, fishing, sailing, fossicking and shell collecting.